A crash that started as simply a slide off of the track in the Formula 3 European Championship race on Saturday turned into an airborne, three-car wreck when another vehicle took a dusty corner, reportedly leaving a driver temporarily unconscious and warranting a hospital trip for two. The crash ended the race. 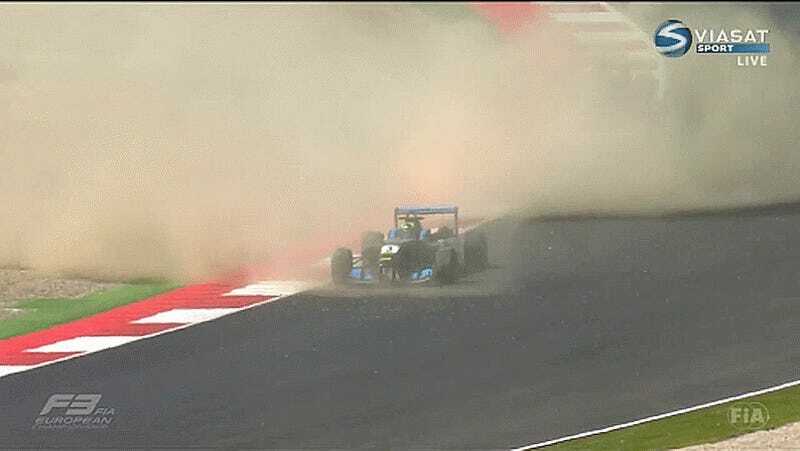 The wreck started when Ryan Tveter slid off of the racing surface at Red Bull Ring in Austria, going through the grass before hitting the gravel trap—meant to be a safety feature for slowing cars down—and kicking up a big cloud of dust. That’s when driver Peter Li Zhi Cong emerges from the dust and hits Tveter, sending Li into an airborne barrel roll and picking up Pedro Piquet in the wreck as well. The wreck came with just over seven minutes left in the race, and the red flag that resulted from it subsequently ended the event and gave Callum Ilott the victory. According to FOX Sports, the series reported one of the drivers—whose name was not specified—as unconscious initially after the incident and awake upon arriving at the medical center. Both Li and Tveter went to the hospital after the crash, according to Autosport, with Li airlifted for potential head and back injuries. Tveter went by ambulance for a precautionary scan, and Piquet sustained no injuries. There are currently no updates on driver conditions. Update: Per FOX Sports, a team statement said Li sustained broken bones in his heel that will require surgery and four fractured vertebrae that will not need surgery.